Successful products drive incremental revenue by improving customer retention and user engagement with each update, while sustaining high operating margins. Developing a profitable product requires keen decision-making and the ability to take appropriate risks. Leading product organizations use data to gain valuable insights about their user base, monitor how their products are truly being used, and make changes that result in higher engagement, lower support costs, and quicker time-to-market for new features. We help our clients use their data to achieve the capabilities critical to developing successful and competitive products. The key to driving business value from product-generated data is developing a strong product analytics capability, and building in a feedback loop that allows data to inform and optimize decisions at every step of the product lifecycle. However, the required data is often difficult to organize and optimize, and so products don’t grow as much as they should. Digital product analytics isn’t just for online businesses. Companies with “pre-digital” products or services are developing powerful digital offerings, such as apps or wearables, to complement their existing business models and drive customer engagement. These digital products help create new data streams that can provide valuable insight into the usage of non-digital product lines. SVDS is an experienced partner in building the capabilities you need to advance how product analytics grow your business. We can help you create scalable and flexible platforms that integrate with your product development process, addressing a broad range of product development and management needs. We can also help to build the infrastructure needed to support your digital product analytics capabilities. Our team of engineers, data scientists, and solutions architects will work closely with your stakeholders to get you up and running with exactly what your organization needs to be successful. Address current product deficiencies. Gain insight into product usage patterns to understand where users get stuck or why they don’t come back. In some cases, purchasing and sign-up flows may confuse users, resulting in significant abandonment. In other cases, sign-ups are high, but specific features or bugs cause users not to return. We work with you and your data to gain key product insights, so you can identify and address specific problems that are holding your products back. Inform new feature development. It can be a significant challenge to identify which among a universe of potential enhancements will drive the most value. Using data to address this ROI problem requires techniques that go beyond traditional reporting and dashboards. We develop models that can significantly illuminate your future product decisions, making feature analytics and prioritization an ongoing capability for your organization. Provide an engaging, personalized customer experience. Users are more likely to keep using a product when they are engaged with it. They are more likely to make a purchase when they see items that are more desirable to them. This is just common sense, but still it is challenging because every user is different! We work with your product teams to develop and deploy algorithms that optimize each user’s experience through personalized interactions. Enable experimentation. It’s often hard to tell whether the changes you make to a product actually improve it: in order to test your hypotheses around product features, you need a capability for experimentation. This capability involves a blend of engineering and data science work. Our holistic teams can help you develop both the required instrumentation for statistical testing and the analytical capabilities needed to evaluate results. Build a platform for scalable, reproducible analytics. To sustain a long-term product analytics capability, you will need a responsive data platform that includes flexible data integration, storage, and processing capabilities. Our expert practitioners work hand-in-hand with your team to design and develop next-generation analytical data platforms and production-grade data pipelines, which serve as the foundation for data-driven product development. Building a digital product analytics capability is not a linear journey; it’s iterative. With each investigation, you gain better, deeper knowledge about your product. With each experiment, you learn which actions measurably affect engagement, revenue, and operational efficiency. Our agile development approach is perfectly suited to this iterative process. We work with your team in a way that ensures constant collaboration to develop the next set of hypotheses to evaluate in a two-week cadence and arrive at informed conclusions—all built on top of a backbone of technical capabilities that fuel your product lifecycle. building models that solve business problems and enable future data-driven decision making. 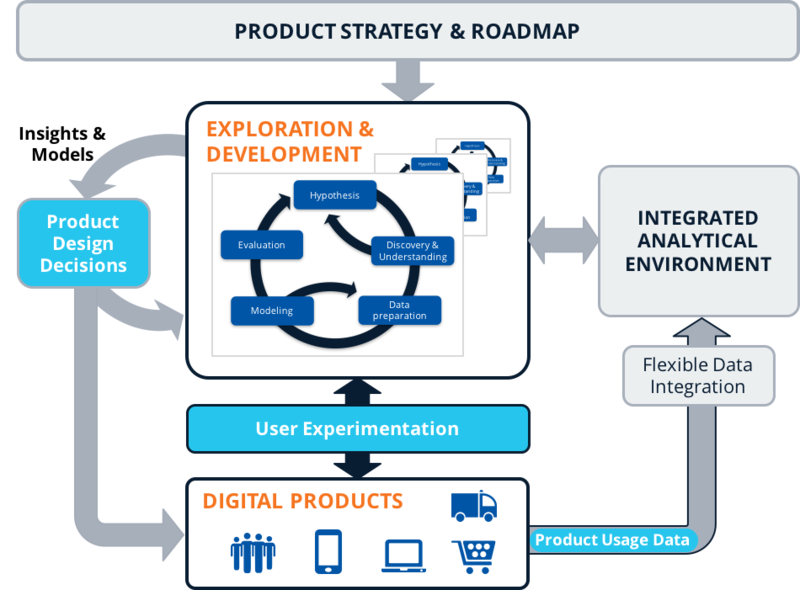 Overall, the design and development lifecycle approach for digital products is a leap forward from approaches that emphasize up-front research and intensive testing prior to deployment. Instead of investing a huge amount of overhead at the beginning—which may or may not satisfy actual customer needs—a foundation of iteration based on data, advanced analytics, and statistically-sound experimentation allows you to rapidly release new features to a controlled subset of users. Instrumentation and data pipelines collect actual usage data to enable evaluation of feature efficacy and value before rolling out a final version to your entire user population. With more engaged customers and an increasingly successful product, your organization will remain poised to take on your competition. And because we work with you to build platforms and analytic capabilities that are both flexible and scalable, they will grow with you as you continue to add additional products and features, continuing to increase your level of insight. If you find that you lack visibility into how your customers are using your product; that you need to enhance your existing product data with data from other sources to enable downstream analysis; that users are not spending time on the parts of your product that make money; or that the data you are collecting across multiple products is inconsistent—then you stand to benefit greatly from this offering.